Blog post by Mum and Volunteer Sheree. It was a Sunday afternoon and I was relaxing watching Netflix, as I'd been feeling a bit off with a mild headache. I was 33 weeks pregnant. I remember laying there thinking surely I can't get much bigger than I currently am, and just thought I was tired from working and that was the reason for my headache. I had a rough nights sleep that night and called in sick the next morning as I just didn't feel like I had the energy to go. I had an appointment with my obstetrician that afternoon, but I still just thought what I was experiencing was normal pregnancy symptoms. It was at that appointment I was told I was being admitted to hospital for observation as I was showing early signs of pre-eclampsia. I was scared and severely emotional. My baby was the result of a hard journey through IVF and the very thought of any threat in my pregnancy resulting in anything other than our dram come true, was too much to bare. I was a total mess. My night that night in the hospital was full of hourly checks and observations and by morning I was told by my obstetrician than I wasn't to return to work, as I was still borderline pre-eclampsia, but I was fine to head home on bed rest. I spent the next 4 days sitting on the couch taking it easy, but on Friday night I began to feel off - a little nauseous and that headache was back. I didn’t know whether to think too much into it or whether to go to the hospital. After an hour wondering I decided to at least call the hospital. After telling them how I was feeling they advised me to come in. So off we went to the hospital and I was hooked up to a machine to see how the baby was going. He was doing well, but I was not. The doctor told my husband and I that my liver and kidneys were showing signs of being in distress and whilst it wasn’t an absolute emergency that night, I was to stay in hospital. I thought I was living a nightmare. I was so scared for my baby and the thought of him being born early was too much for me to cope with. I was an emotional wreck. The next three days were a routine of hourly checks and lots of blood tests. 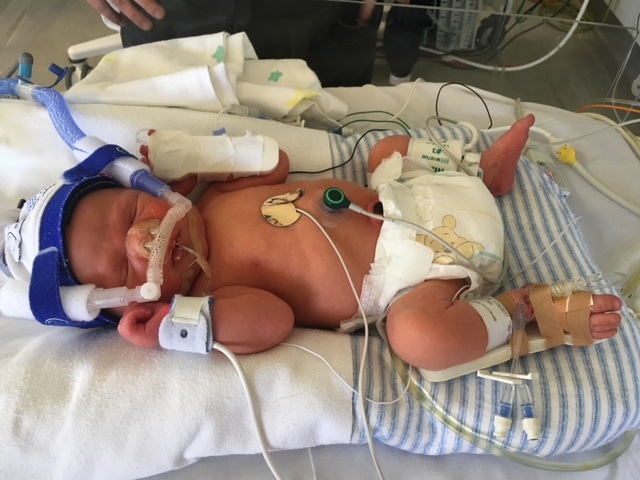 By Monday morning my obstetrician wasn’t willing to hold off any longer and I was to have a caesarean that morning, as my condition had worsened. Again with the freaking out. The nurses were so supportive. I was taken down to the Neonatal Unit to see where my baby would go when he was born. It was weirdly comforting and intense all at the same time. The nurses talked me through what some of the machines were and what role they would play for my baby. My son was born 3 hours later at 33 weeks and 4 days. He came out crying and weed everywhere, so I was able to hold him before he was taken away. It was this moment I hadn’t wanted to miss out, of all the moments you get when having a baby. I was so amazingly happy and so in love. We spent 3 weeks in NICU before my son was able to come home. The nurses and doctors in our nursery were absolutely amazing. I was allowed to be my sons mother. Even though changing a baby with cords is difficult, it was amazing. The day we were told we could take him home, I panicked. We were in this safe little bubble in the nursery and it just seemed so scary that suddenly I really would be totally in charge. My son is now 14 months old. He’s endured two surgeries in his short life, but he is healthy, happy and totally adorable. When we think back to our time in the nursery, we just remember how lucky we were that all our little man had to do was grow a little. For some this isn’t the case. The experience has made us more aware of what others sometimes have to go through, and how lucky we are. Every day with our son is amazing. We welcome you to share your story with us. Please e-mail your story along with a few pictures to admin@tinysparkswa.org.au with 'Family Story' in the subject.